January 2013 I took a role as a Wilton Method Instructor in Queens, NY. It was a freezing cold winter however my classes were moderately full. In spring 2013, I met four wonderful women who would constantly interrupt my class with humor. Those four wonderful women took all of my Wilton classes and a friendship grew out of the class. Alice was the quietest but the most hilarious at the same time. We had a great time when we were together. She was a lovely woman who planned on retiring back to the Philippines. During one of my class instructions, Alice un-wrapped her cake and everyone after a few seconds paused giving her our full attention. The scent was indulging. “Alice, my goodness is that a lemon cake? Its smells divine what are you doing?” Alice laughed, “Yes teacher” smiling “it’s my lemon cake”. We were all interested in her cake. I had to scrap the top that was on the foil paper when she uncovered it. It not only smelled divine it tasted delicious. I couldn’t get over the scent of her cake. During other classes, I continued to rave about her cake. A week or two later, Alice slipped me the recipe of her lemon cake during our last class. I couldn’t believe it I was in awe. As time goes on people lost contact and I lost contact with Alice. I’ve left her voicemail messages in the past with no return phone calls. She could’ve returned to Philippines. Wherever she is I hope that sweet Alice is doing well. 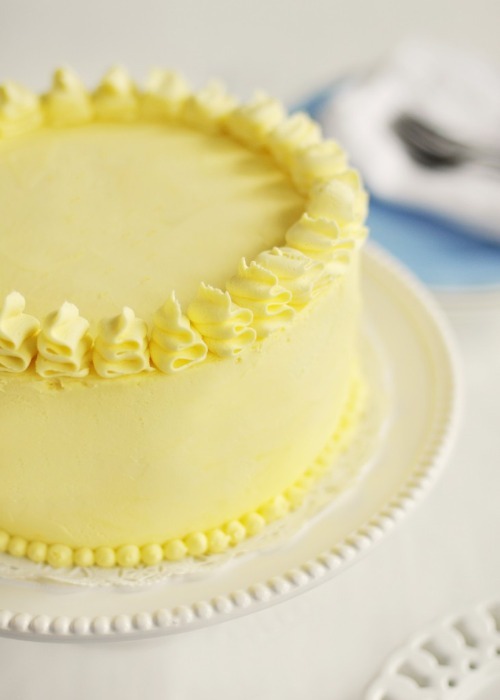 Lemon is a refreshing flavor that most bakers offer in the spring and summer. I am gifting this recipe of love to my followers given to me by Alice. I am hoping that by sharing this recipe it will bring other people together as it brought me to Alice and my other friends. I hope that wherever Alice is she is doing well and is surrounded by love. Directions: Combine the unsalted butter and eggs beat on high until light and fluffy. Add the granulated sugar and continue to beat on high. Add the lemon extract, lemon zest, and vanilla. Mix all of the dry ingredients in a separate bowl such as the flour, baking powder, and salt. Add the dry ingredients to the wet mixture and pour into two 8 inches round baking pans. Bake at 325 degrees for 25-30 minutes.